planet manners: Pacific coast off Peru: I signed. They're killing dolphins for shark bait!?! Pacific coast off Peru: I signed. They're killing dolphins for shark bait!?! 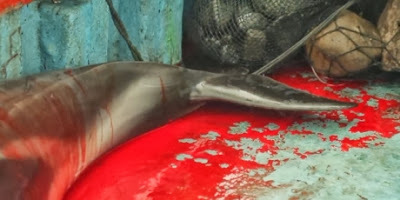 "Through this petition we demand you enforce the law with regards to the hunting and sale of dolphins for food and bait in Peru. We have all witnessed through various publications and images the terrible crime that happens on our shores. According to information published, 15,000 dolphins a year in are being killed in Peru. Don’t destroy our ocean. There is no going back. We ask you to STOP THESE ACTS and make those responsible pay. We do not ask for miracles." Here is text from the petition posted at AVAAZ.org. I just saw a report on the news in Peru showing how fishermen are slaughtering up to 15,000 dolphins every year -- for bait to catch endangered sharks. The entire story made me sick -- and now I'm fighting to end this nightmare. Will you join me? My government is starting to react, but they're not taking enough action yet. Dolphin hunting is already illegal and punishable with several years in prison, but authorities are turning a blind eye -- allowing thousands of dolphins and sharks to be butchered. The government cares a lot about Peru's international reputation, especially for tourism, and if we can make them feel embarrassed with a massive global campaign, I'm sure they'll start taking action to end the massacre. Once I deliver a million signatures from all over the world to the government of Peru, Avaaz will place ads in tourism magazines in countries where most of our tourists come from and the government won’t be able to ignore us! Help me stop the brutal slaughter by signing now. This petition was started by Zoe Massey on the Avaaz community petition site.